Another Kuler5 contest has arrived, and this time we have a ton of amazing prizes from Zack Lovatt and Tomas Sinkunas. We usually pick a very specific theme to challenge your creative minds, but this time we’re going simple: shapes. 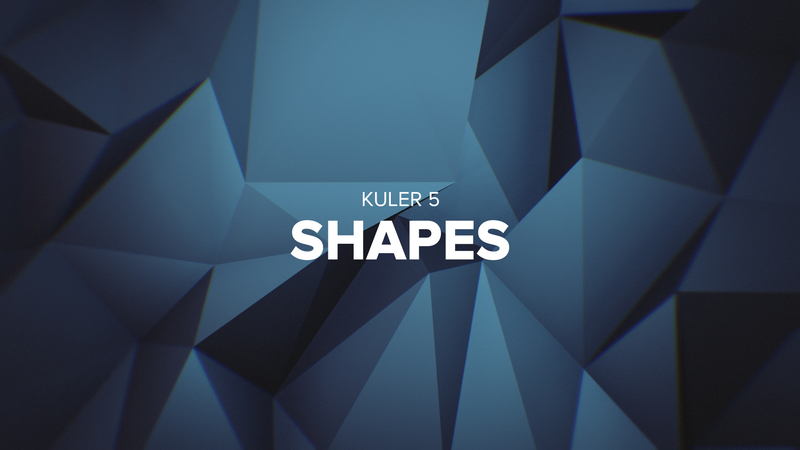 For those who are new, Kuler5 is a contest where you create a 5 second animation using any Kuler palette and a theme. The best submissions get featured on the site and win a cool prize. You can interpret the theme however you want, just as long as it’s related in some ‘shape’ or form. Amazing color label workflow script that gives you many options to color coordinate your layers quickly and efficiently. You can colorize by parent chain, layer type, prefix, and much more to keep things consistent across your projects. A workflow script that can optimize and remove unnecessary/redundant keyframes, smartly bake your expressions nondestructively, and speed up your projects. This is a must have tool for expression-heavy projects, and makes it very easy to manage the baking of certain properties (or the whole project). Powerful script that converts your AE project files to sharable, dynamic code. Rebuild whole projects instantly, with tokens where a user could modify layer names, footage sources, and custom text layers during creation. Dynamically create branding packages such as lower thirds and titles in an easy-to-use UI panel. Zack’s bread-and-butter script that is essential if you even touch shape layers in AE. Easily split each shape out to its own individual layer, merge shapes into one, quickly convert Illustrator layers to shapes, and access Fill/Stroke immediately. Easily slice up footage or layers that are pre-rigged with customizable controls for easy animation. This makes cut or slide animations a breeze. Like the ESL script, this tool is a must have for AE shape users out there who need full, but easy control over their shapes. The tool can add various rounding algorithms, access shape vertex coordinate data, tangents, and much more. As always, try to think outside the box and take the theme to a whole new level. Kuler5 was made to encourage experimentation and new techniques, so try a style you’ve never tried before. Special thanks to Zack and Tomas for sponsoring this Kuler5 contest. Check out the rest of their products if you like the stuff you’re seeing from them! I can’t wait to see some of the stuff you guys come up with. Here is my entry. I would love to tweak it a bit, but I have a long week ahead of me. When I get a chance I want to create a longer render with this little guy. Beautiful work as always Kevin! Thanks VinhSon! I appreciate it! As always, you placed Kevin. Contact me via email to claim your prize! I went for a coastal view of a town populated by shape people. I also made it to be looped, but im not sure how I would show that on here. Nice work again! Contact me via my contact page to claim your prize. Congrats Christian! Contact me via my contact form to claim your prize! Hey Jeremy, contact me via my contact form to claim your prize! Description: Dizzy Simple shapes! Quick entry done during lunch break 🙂 Thanks and good luck! Thanks Vinhson for the C4d Adobe Live session!! Very nice work Raphael! Dig the transitions, and thanks for the kind words! Contact me via my contact page or Twitter to claim your prize! Awesome work! Contact me via my contact form to claim your prize!